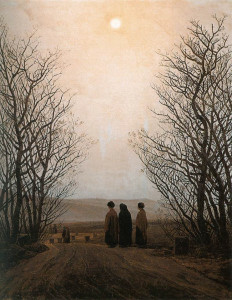 We celebrated the mysterious holiday/holyday of Maundy Thursday by night, and this gathering by night returns again for Holy Saturday, the last day of the Easter Triduum. The mysteries deepen as sunset brings the Easter celebration in its oldest form: the Easter Vigil. We gather together and we begin in darkness. A fire is kindled, and from that new flame, all the candles are lit. Each and every person holds one. The transformation and the return of light is tangible and real. There is no mistaking it: darkness is overcome. It’s Holy Saturday, the night that officially closes the somber and reflective season of Lent, and the even more somber and reflective week known as Holy Week. We Catholics cap off the week with the hours-long Easter Vigil mass, a test of will for anyone, to be sure. But it is this mass that is the high point of the liturgical year, a grand spectacle to usher in the miracle of Easter. Tonight’s long Easter Vigil mass at St. Bernard’s lacked a little something, though, and the general sense was that this year’s transition from Darkness to Light, from Somber to Joy, from Death to Life, was not quite as dramatic as it was in years past. And we can all pretty much place this sense of inadequacy on the statue of the Risen Lord at the back of the church. The concept each year is the same: We begin after sunset in a dark chuch, and once the good news is proclaimed, the lights and the organ grow gradually brighter and louder, while the bells ring triumphantly, as all the marble statues are released from the purple shrouds that have covered them since Holy Thursday. But the statue of the Risen Lord, which hangs some four feet above the doorway opposite the altar, is well known amongst the congregation as the the Statue That Fell Upon the Head of the Usher, which happened as the unfortunate man was using a pole to release it from its purple shroud on another Easter Vigil night, three or four years ago. It’s happened just that one time, but still, the ushers grow increasingly timid with each passing year, and what used to be done with great zeal and flourish is now done rather gingerly and with palpable fear. The lights are all on and Sister Kathleen, the reluctant organist, has gone well past crescendo and so has no choice but to settle into quiet notes––notes that feel a bit like they’ve worn their welcome––and Father Seamus watches and prays from the altar, and the congregation turns and winces and looks away because they don’t want to watch what’s happening with the pole and the purple cloth but they turn again to watch anyway, lest they miss what might happen if it happens, and there is more wincing, and then finally one usher goes in for a folding chair, one of the chairs behind the back pew for the potential overflow Easter crowd. He gets the chair to stand on it, so as to have more control over the situation, or perhaps to lessen the blow should the statue fall again by reducing the distance and velocity it would travel downward toward his head––but then he hesitates again and Sister Kathleen just flat out stops playing and finally the other ushers just gather together and go for it in a great show of Christian strength and solidarity. They push the pole up under the purple cloak and lift it from the head of Christ and the statue rocks back and forth and there is, somewhere, an audible gasp. But the statue of the Risen Lord settles down again, and all is well for another year, no ushers are in need of stitches, none have been clobbered into unconsciousness. And the ushers are all okay! And when the nighttime mass is done, we great each other with “Happy Easter.” And so Happy Easter, Happy Spring. May your days have great flourish when they need to. 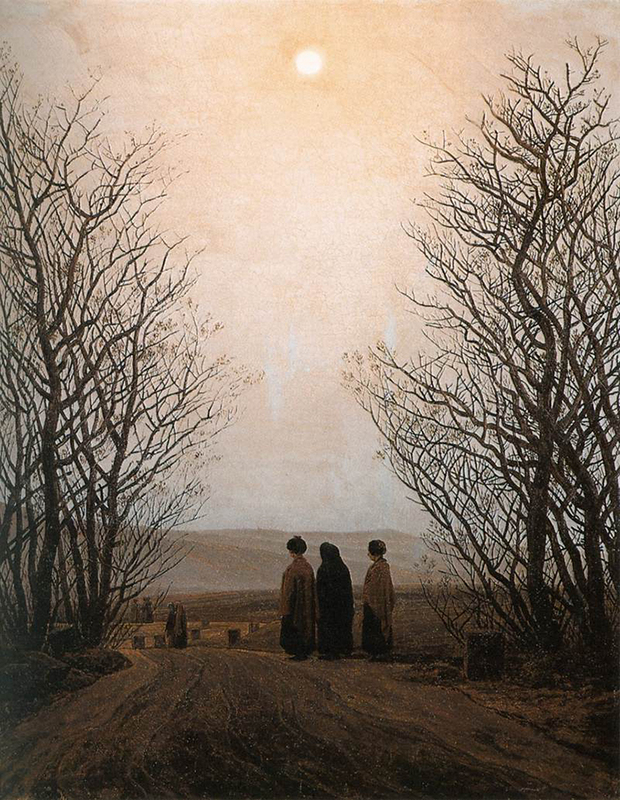 Image: Easter Morning by Caspar David Friedrich, oil on canvas, 1833, [Public domain], via WikiPaintings. Thanks, we needed a good chuckle!